Over 60 years and growing. Founded as Waco Scaffolding of Philadelphia in 1952 by Albert Bianchini, the company quickly grew to become an industry leader. His name and company were associated with the most prestigious projects in the Tri-State area (Veterans Stadium, the Ben Franklin Bridge, Independence Hall). Albert built his reputation on superior customer service. Meeting and exceeding client’s needs has always been priority number one. By keeping a smaller, family run operation he was able to service clients quickly and effectively (a trait Superior still employs today) where other corporate giants could not. After selling to the parent company Albert reformed as Superior Scaffold Services with most of the senior personnel still on board. 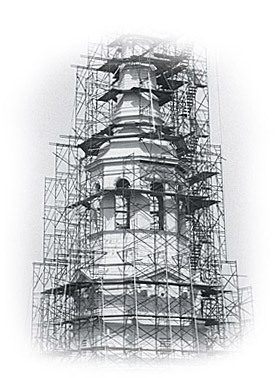 Upon it’s reinvention in late 1992, Superior Scaffold Services, Inc. employed only eight people working out of a construction trailer in North Philadelphia. Along with its main office/warehouse facility in Philadelphia, Superior now has the equipment and personnel necessary to handle ANY job. Employing exclusively union labor in the field, Superior has built one of the best safety records in the industry while erecting scaffolding and shoring systems throughout the tri-state region. Today, along with sons Guy Bianchini (CEO) and Gary Bianchini (Pres. ), Albert Bianchini is forging a new company that is adding to that list of notable projects (see client list). Superior has steadily grown into a dominant player in the scaffolding market, proving that no job is too large or small to handle; all the while, still incorporating Albert’s vision of a family owned, customer-centric business that can respond faster, better, and more efficiently than any other scaffold company on the market. See why we are Superior!